How cool is this custom shampoo & conditioner set? I love seeing my name on the bottle and I am a big fan of the scent & what it is that the set does for my hair. Let me back up a bit & start from the beginning. 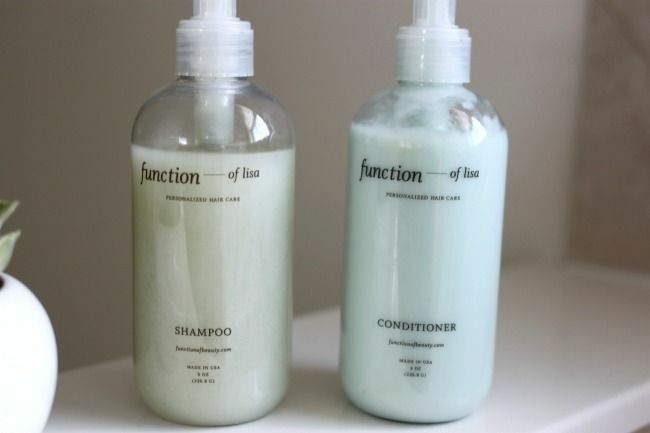 I was asked if I'd like to try out custom shampoo & conditioner from Function of Beauty. After agreeing, I headed over to their website and picked out literally everything about them based on my needs and tastes! The selection process is broken down into three main topics; profile, goals, & fragrance. For my profile, I chose wavy, fine, & normal hair. My goals were color protection, hydrate, anti-frizz, shine, & lengthen and the fragrance I chose is grapefruit hibiscus. That explains why I love what it has been doing for my hair the past three weeks and the scent so much...I made it that way! My only critique would be that the although the packaging is adorable, it's not super functional. When you pump the product, to get the amount of shampoo that you need to get a good lather going, is about 10 pumps. This style bottle would be better for a lotion if that makes sense. You also don't get too much bang for your buck. I am 3 weeks into using these products, and the bottles are almost gone. Again, I am loving the products as they really do deliver what it says it will, I just wish there was more of it for the price. This 8oz set retails for $26 & the 16oz set is $38. Overall, I am a big fan of Function of Beauty. I love the concept and how it displays your name on the front. Plus, I can't wait to see what is in their future. I can't believe this company has only been around for 1 year! Have you ever tried custom shampoo & conditioner? What do you think of Function of Beauty?